Fixed platforms offer very good performance because of their rigid, immovable nature. 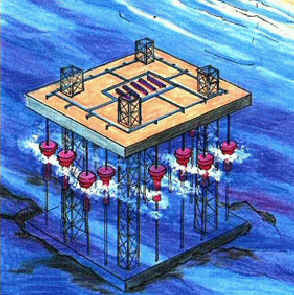 (See Figure 8) The waves act only on the floats, not the platform (pilings), making platform designs the most effective energy converters. Their drawbacks are that they have pilings driven into the sea floor and so must be located close to shore in shallow waters where wave energies are less than out at sea. Depending on the design, the number of pilings can also become cost prohibitive. Overall, fixed platform designs rank as high on the comparative efficiency scale.